A millennia-old group will soon leave the colonies Sri Lanka moved it to years ago and return to its forest home. When the following article came to Cultural Survival from the Cultural Survival Trust of Sri Lanka, it was the first contact between our organizations. The Sri Lanka group is not aftiliated with Cultural Survival, yet, as the excerpt from their letter to us on the next page shows, we have much in common. The island-nation of Sri Lanka, an ethnically plural society with sizable Hindu, Muslim, and Christian minorities dominated by a Buddhist majority, may be witnessing the disappearance of the Veddha. Subject to relentless proselytizing from successive govemments, only a few hundred Veddha families preserve their ancestral identity in the face of ambitious plans to assimilate and integrate them into the majority community. Traditionally a culture of nomadic hunters, Veddhas managed the island's extensive forests with remarkable economy and ingenuity for tens of thousands of years. They also gather wild honey and other forest products to sell or exchange for the few items they value from outside their domain. Once the sole human culture in ancient Lanka, the Veddha have been steadily marginalized over the centuries by the descendants of Sinhalese immigrants from India and today face final extinction as a distinct culture. In recent years, the Veddha have had to deal with rude official demands to hand over their last ancestral hunting grounds in eastem Sri Lanka to govemment agencies claiming to be anxious to protect their resource-rich forests. Several years ago, after being cajoled and coopted by govemment promises of a better life, many Veddha families accepted resettlement in two large colonies in the massive Mahaweli hydro-electric and irrigation development project. Fed up with what they regard as official exploitation and the corruption of modem society, tribal leaders have announced a decision to terminate their experiment with colony life. After harvesting their chena crops in May 1992, about 50 Veddha colonists plan to leave the colonies and return to the forest, while some others are watching and waiting. The dissidents are determined to return, despite uncertainties about what action local officials may decide to take. Moreover, there are concems about starvation if they leave the govemment colonies but are not allowed to return to hunt and gather food in their former domain. Although an ancestral hunting community, the Veddhas say they are dedicated to non-violence. However, they feel exposed and vulnerable to what they perceive as official hostility toward their "backward" culture. Saying they have no one else to turn to, the dissident colonized Veddha -- numerically weak but substantial in a community that is estimated and_ to numbrr only 2,000 -- has appealed to Cultural Survival of Sri Lanka and others for help in their struggle. Tribal leaders allege that corrupt officials have forcefully barred Veddhas from their own forests, brazenly profiting from lucrative illegal logging and unlicensed commercial hunting and depriving the Veddhas of access to their traditional livelihood, staple diet, and sacred dancing grounds. Much to the chagrin of officials, elder tribal chieftain Tissahamy and several stalwart families refused to leave the forest and vowed they would fight if necessary to preserve their ancestral traditions. Previous governments had tried to cheat them many times before, they noted. For example, since 1974, Veddha leaders have listened to official assurances that 1,500 acres within the Maduru-Oya National Park would be given to them as a sanctuary. In fact, mindful of the great value of cultural diversity and indigenous knowledge, high-level officials in mid-1990 recommended that urgent steps be taken to expedite the proposal. But to this day the appointed board of trustees has not met, lending credence to Veeddha allegations of vested bureaucratic interest in the issue. Today, Veddha colonists find themselves isolated and exposed to the mercies of a modern mercantile society, quite unlike their own in which crime, deceit, and avariciousness are virtually unheard of. 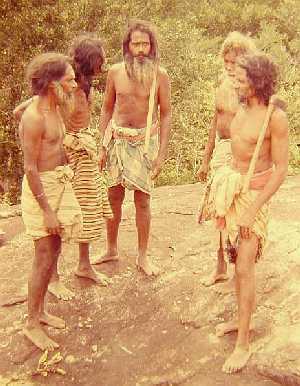 The forest people, subject to often not-so-subtle ridicule for speaking in the Veddha dialect and expressing their distinctive point of view, feel they have traded the freedom and dignity of the foltst for servitude to an alien market economy that mercilessly compels them to abandon the last vestiges of their ancestral culture. Their marginal economic gains, they feel, do not justify the sacrifice of an age-old collective identity as a forest-dwelling people. "All the old people want to return, and our children also prefer our traditional way of life," says one tribal leader. "We will protect our forests just as we always have. These officials are not forest people who love the jungle; they are only businessmen getting rich by selling our forests and game animals." By selecting May 16, the Buddhist high holiday of Wesak full moon, as the day for their collective return, the Veddhas have chosen to make on emphatic show of their will to affirm their curtural independence. Govemment officials have not yet reacted to the Veddhas' decision, although dissident minority Tamils fighting for independence have expressed keen interest and say it could represent a welcome precedent heralding a peaceful settlement (see sidebar). Some have even proposed that the Veddhas be encouraged to occupy the buffer zone between Sinhakese and Tamil areas to arrest the problems of colonization. In late January 1992, Cultural Survival of Sri Lanka urged the government to take prompt steps to implement its stated intention of saving the Veddha commurlity from cultural annillilation. Yet as of late March, no action had been taken upon a ministerial directive to convene the first meeting of a board of concerned governmental and non-governmental agencies, including Cultural Survival. Cultural Survival has urged the Sri Lanka Government to give back the Veddhas' bows and arrows publicly and to hail the move to revive traditional Veddha cultural values. The Government could use the opportunity to encourage the rejuvenation of other threatened communities and the preservation of their local knowledge and skills. Unfortunately, contrary interests appear to be preventing the Government from backing up its promises. "We seem to be active in identical areas with little coordination. In 1992, we should try and bridge this gap since unity of purpose is strength. Our work among indigenous cultures in Sri Lanka includes the Veddhas and the Puranagama people, the latter being traditional cultivators left behind by the development process. We are the only NGO in Sri Lanka concerned about protecting these people within the framework of their own cultural ethos. In spite of growing global recognition, in Sri Lanka the information order precludes our decision makers from seeing the urgent need to protect threatened cultures. The preoccupation seems to be industrialization without recognizing the need to protect distinct cultural identities. We are witnessing in Sri Lanka the destruction of a way of life that has sustained itself in harmony with nature for several centuries. Although we are ourselves consultants to the government, as well as to other public and private bodies, the urban decision-making process requires reeducation in keeping with what modem science is confirming: that indigenous cultures be urgently protected. Although in Sri Lanka vast plans and schemes are regularly announced by the Government, implementation takes ages and when undertaken they are mostly for the decision makers' benefit and not for the indigenous people themselves. For example, we have recently been appointed by the Government to a board to protect and preserve Veddha culture, but the board has yet to meet. Although the cabinet decided 15 months ago that this board was an urgent necessity in helping preserve the "vanishing Veddha," not a single Veddha is on the board. We therefore require your help in networking with like-minded organizations and individuals worldwide who will assist in our work. We need an internatiomal network that will provide us with a global voice to be heard locally. In Third World cultures what is imported is always given credibility and political trends follow intenational lobbies. Initially, we have been documenting indigenous Vanni culture on film. This material is the nucleus of an image and sound bank from which six 30-minute programs are being produced. This in-depth series of our oral traditions has been financed with our own resources to educate others about what is intact as indigenous culture in Sri Lanka. We have also built and maintained a model village dwelling in the heart of the city of Colombo to demonstrate to urban planners the efficacy of rural housing models. Our work in education has enabled us to arrange for those interested in indigenous culture to learn it by "living it." Conflict resolution has been promoted through the use of traditional institutions. You may be aware that militarization and colonization have created several problems in forest regions once occupied by traditional communities. This has led to a war with traditional communities and their environments threatened through conflict. If the Veddha community is granted the disputed buffer zones to continue its traditional lifestyle, we have been assured that the rebel groups will accept their claims, protesting only against outside infiltration of tribal areas. We feel that this attitude will enable a peaceful solution to a 10-year war. However, it will require international pressure to force the decision makers, as well as the growing militant mentality, to accept these values.